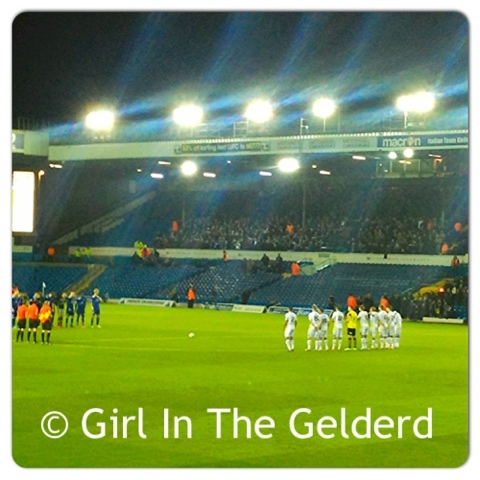 I don't think I have to mention how us Leeds United fans loathe Tuesday's. The last time we won a League game on a Tuesday was a year ago on the 29th November which was away at the County Ground 3 days after the death of Leeds Legend, Gary Speed. 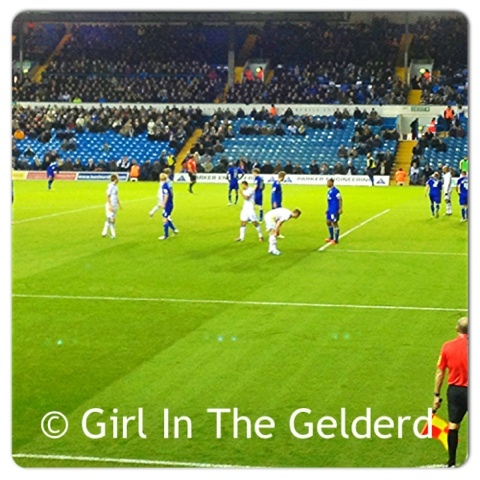 It was exactly a year to the day that the Footballing world lost a great in Gary Speed and our tough run of games continued, Leicester City the visitors to Elland Road. 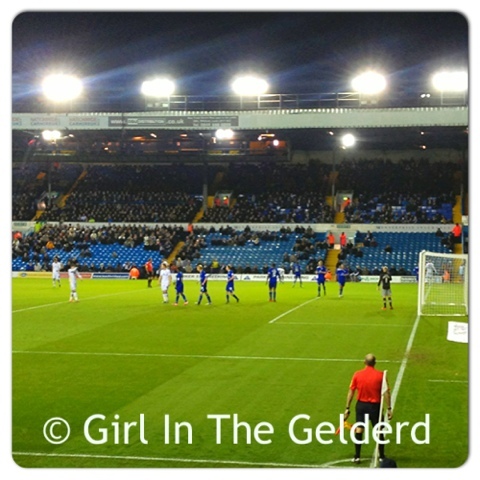 Warnock announced an unchanged side to the one that defeated Crystal Palace at the weekend. Both sides came out of the tunnel and faced each other on the centre circle to pay tribute to Speed with a minute's applause. In the first minute Jerome Thomas broke down the wing and the Leicester defense were forced to make a clearance, resulting in a corner. Diouf took the corner, Danny Drinkwater cleared the ball away from any danger. Sam Bryam ran at the visitors moments later, but was brought down in the area by Jeff Schlupp. The referee, Mick Russell had no doubts in his mind and gave the penalty. Luciano Becchio took to the spot, facing old team mate, Kasper Schmichel. Becchio sent Schmichel the wrong way to make the score 1 - 0 early on. A corner was taken on the 4th minute by Andy King, Sam Byram was in a great position within the box to clear it. On the 11th minute, the Elland Road scoreboard changed to a picture of the Billy Bremner statue with number 11 in the sky. We all began to sing his name for 11 minutes, as we had done almost a year previously. After a bright opening 10 minutes, the game began to settle down as both sides exchanged possession, with no real end product from either outfit. On the 25th minute though, Tom Lees headed just wide of the goal after a corner came in from Diouf. A minute later, Luciano Becchio crossed a fantastic ball in to Green. 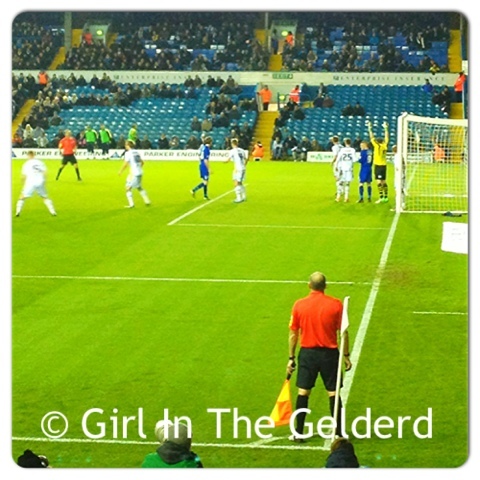 Green had a ferocious shot and Schmeichel pulled off a superb reflex save to tip it over the bar. Martyn Waghorn found himself with plenty of space to shoot from 20 yards out, in front of the Kop on the 33rd minute. His effort on goal was poor however and Paddy Kenny scooped the ball up with ease. El-Hadji Diouf was one on one with a Foxes defender on the 38th minute and had a perfect opportunity to shoot, he went down in the box however, and seemed to be in disbelief when no penalty was given. The last significant chance of the first half came on the 43rd minute for the visitors. Jamie Vardy shot wide of the target from just inside the area. So, half time came and we were all really pleased with the way we playing, people were commenting on how much we looked like a different side, and we did, so far, we were playing football and we had pace in Thomas and Byram, we had confidence, but we still had to be cautious coming out in the second half. The next 45 minutes were crucial as to just what kind of a Tuesday night this was going to be. Leicester started the 2nd half much stronger than we had. On the 50th minute, Ritchie De Laet was booked for a foul on Jerome Thomas. Kasper Schmeichel was subject to abuse from the Kop throughout the second half, thanks to him being cocky with them when the ball went out of play. No-one was giving him the ball back, he got bored of waiting and walked away in a little huff, the Leeds fan that had the ball, then threw it onto the pitch and it hit him. He had a bit of a strop and took the goal kick. He didn't find it funny....But we did. Leicester made two changes, bringing Futacs on for Jamie Vardy and Knockaert for Ben Marshall. We were inviting pressure and slacking off a bit too much for my liking. Martyn Waghorn shot from, close range but it cleared the crossbar. Knockaert tried to even the score with a long range effort which Paddy Kenny saved. The corner was taken by Waghorn, Becchio cleared it away. Jerome Thomas was replaced on the 61st minute with Michael Brown. A perfect pass from Luciano Becchio to Brown who was just on the edge of the penalty area four minutes later and it looked for all the world Brown was going to make it 2 - 0, the shot ended up just wide however and we were all hoping, it wasn't going to come back to haunt us. Leicester were coming back into the game and an equaliser seemed around the corner, 70 minutes played and I think we were all hoping these 20 mins would fly and we could hold them out. Sam Byram made what might have been a crucial error, albeit one of his first of the night, when he lost his man, Futacs' effort glances the goal and goes wide, thankfully!! Luciano Becchio picks up the ball outside the penalty area and ends up one on one with the keeper, unbeknown to him the linesman had flagged him offside, he did put it past Schmeichel but obviously, the goal wasn't given. 4 minutes of injury time was added on and it was always going to be nervy with only a one goal cushion. We held out though and the ref blew his whistle to end the game. WE WON ON A TUESDAY NIGHT!!!! Man of the match has got to be Norris for me, he worked tirelessly throughout the whole game, having looked after the ball extremely well all night, which enabled him to carve out several changes for Becchio & Diouf as well as our wide players. Jerome Thomas has changed our style of play for the better since joining last week on loan from West Brom. His pace and his ability to cut through a team's midfield has allowed us to play football again, rather than the god awful long ball we all hated. 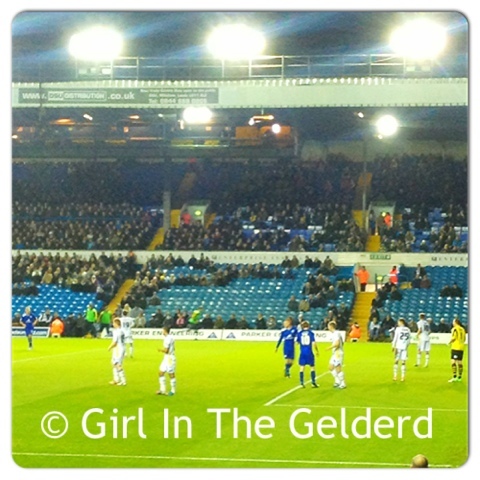 Forward play is more positive and Becchio seemed confident and had a brilliant game. It was nice to not only see him hunting for goals in open play, but to hold the ball up and also put in a few good crosses too. Tom Lees had a great game too and has been aided by some much needed confidence with the arrival of on loan defender Alan Tate, who looks like he has been playing at Elland Road for years. It is odd to feel this positive on a Wednesday, but nice ha ha. Another tough game at the weekend, away to Huddersfield....Should be interesting!! Hope we manage to take the confidence we have gained into that game and lets hope for another 3 points.